Sir Paul McCartney's Choral Piece Sir Paul McCartney discusses his new choral piece, Ecce Cor Meum, or Behold My Heart. 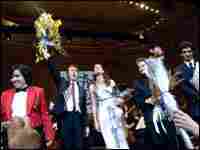 It was first performed in London earlier this month, and had its American premiere at Carnegie Hall earlier this week. Sir Paul McCartney discusses his new choral piece, Ecce Cor Meum, or Behold My Heart. It was first performed in London earlier this month, and had its American premiere at Carnegie Hall earlier this week. This week, NPR special correspondent Susan Stamberg went into a studio in Washington, D.C. and got linked up with her guest in New York and was quite excited. SUSAN STAMBERG: Sir Paul, I am thrilled. You are my first Beatle. And I've been in broadcasting for 110 years. Sir PAUL MCCARTNEY (Musician): Well, you are not my first NPR. STAMBERG: Now, Scott. Did you ever talk to him? SIMON: No. But actually, we go on an annual cruise in the Greek islands together, our two families. SIMON: ...and Renee Montagne, and Martin Goldsmith, and the Car Guys, if I'm not mistaken, have all interviewed Sir Paul. STAMBERG: But Sir Scott, you can't take this personally, and I hope you won't. But I did get a chance to talk with him this week, and here's why. He was rehearsing at Riverside Church in New York for a concert that was held at Carnegie Hall this past Tuesday. It's a new spiritual choral that he wrote, and that' what was on the program. But the concert started with some classicized versions of McCartney pop tunes. Mr. ANDREW STAPLES (Tenor): (Singing) I will hold you for as long as you like. I'll hold you for the rest of my life. STAMBERG: The tenor Andrew Staples. The soprano Kate Royal. Sir Paul McCartney's most recent work is an oratory of that he calls - well, let's have him pronounce it. Sir MCCARTNEY: We call it Ecce Cor Meum, or Behold My Heart. STAMBERG: Thank you. The piece is written for orchestra, soprano and mixed choirs; and in the mix, a boy's choir. STAMBERG: I happen to think that that is one of the loveliest sounds in the world, the sounds of children singing. Sir MCCARTNEY: I love it too. It is a great sound. STAMBERG: I know that you sang in your church choir when you were a little kid in Liverpool. What are your memories of that? Sir MCCARTNEY: You know, it's funny. We were rehearsing here at Riverside in New York and going backstage behind the altar completely reminds me of - I worked at a little church called St. Barnabas in Penny Lane in Liverpool. And seeing the robes and seeing the accoutrements and things backstage completely reminded me of being a young teenager. I didn't have a sort of wide experience at that time of much more than going to school on my street, so any little thing that was different I always found exciting. It was good for the imagination. STAMBERG: Paul McCartney says the title of this choral, Ecce Cor Meum, came to him when he was in another church. Sir MCCARTNEY: I was sitting in the pews, looking around at the architecture, and I spotted this crucifixion. And underneath it, it said Ecce Cor Meum. So I spent a few minutes trying to work it out, dredging up my schoolboy Latin, and I remembered that ecce meant behold, I remembered Ecce Caesar. And so I got that bit and then I worked cor out - to do with corona and coronary - and worked out that that meant heart. And then meum was pretty easy. So I thought that must be mine. So behold, heart, mine. And I then, as I started to sort oft think about that, I thought, well, I won't make the work essentially Christian because I like to bridge all religions. So I will keep mine accessible to Jewish people, to Muslims, to any religion, really, and Christians too. But I thought, well, what does behold my heart mean to me? And it seemed to me that it was sort of let me give you my spiritual views, let me give you an idea of what I hold important in my heart. So you know, things like truths, love, peace, spiritual welfare, and things like that, that have always seemed important. I thought, well, it's a pretty good basis for the piece. STAMBERG: This is music of sadness, not exclusively that, but it's certainly bears that, in grief over the death in 1998 of your wife, Linda. She died while you were writing this piece. Sir MCCARTNEY: That's right. She was very much a part of it in the beginning. And then when she passed away, I really couldn't write and I spent quite a period obviously grieving. But then when I came out of the worst of that period, I was able to get back writing. And so in the middle of this piece you will hear what we call the interlude, brackets Lament. And that's really probably the saddest part of the whole piece, and that was what got me back into writing. I was able to sort of write out my grief. STAMBERG: You have a history with classical music. You started writing it around 1991. And I wonder what - what does classical music let you do, Paul McCartney, that the music may be you're most famous for does not? Sir MCCARTNEY: I really - the major difference to me is the length. It's like writing a short story or a novel. I love doing both. I think, you know, short stories are great. Short songs are fabulous. It's nice to have to condense something down and get it all said within three to four minutes or so. But I like the idea of being able to stretch and being able to bring themes back, vary them. So it's just a bigger painting. 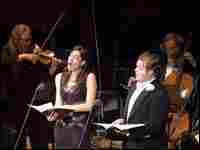 STAMBERG: This was - it was performed in London in early November. And forgive me, but from what I read, the critics didn't jump up and down in glee. They said that the music was kind of simplistic. I think the word pleasant was used. Is that worse than calling something interesting? Sir MCCARTNEY: I think it is, isn't it? Yeah. Like she's an interesting woman. Sir MCCARTNEY: You know what? When I started, people said to me, now look out, Paul, the critics are going to have their pencils sharpened for you. And I know that. I mean Sergeant Pepper was damned by the New York Times. She Loves You was called banal. So I'm kind of used to it. Sir MCCARTNEY: It's the people who count. I'm not really interested in critics. I'm not going to write anything for them. I can write atonal, rough, tough stuff that they might like and think, wow, he's really far out, dude. But that's not me. I write melody. It's what I like to do. And if someone comes along and thinks it's a bit sweet, so he shouldn't come next time. STAMBERG: There's a section in Ecce in which the lyric goes: here in my music I show you my heart. That's a lovely notion and it's probably as true for your classical music as it is for everything else you write. Sir MCCARTNEY: The context of that is that in the future we may be apart. In other words, I won't be around forever. But here in my music I show you my heart. So even after I'm gone, you'll know who I was. You should listen to this piece and you'll see what I value. You should listen to Eleanor Rigby and you'll know what I think is important. You should listen to any of my music and the message is in the music. STAMBERG: This work I know took you eight years to finish. These days you're going through an awful - very rough divorce from Heather Mills; scandal stuff all over the tabloids. Does this music give you a refuge from all of that, Sir Paul? Sir MCCARTNEY: It's - yeah, music generally is a great refuge. All my life, I've often said - and I know this with other friend of mine who've composed - if you're not in the greatest of moods, you can go off, you can find yourself a little corner somewhere, and if you're able to write a song or play some music, it's often a great healer. And you've written out your anger, or your grief, or whatever it is. STAMBERG: How lucky you are. But I think it's also true for all of us. I mean that's what great art does for us too, I think. Sir MCCARTNEY: I think so. You know, I think so many people come up to me and say your music has really helped me through college with this. I just didn't know what to do with myself but I listened to your music. My children grew up with Beatle music. And I love the fact that even people who don't write it feel this. It's a magical thing for all of us. STAMBERG: Thank you so much for talking. Sir MCCARTNEY: Thank you very much. STAMBERG: A pleasure to talk with you. Sir MCCARTNEY: It was a pleasant interview. SIMON: Sir Paul McCartney talking about his oratorio, Ecce Cor Meum, with NPR's Dame Susan Stamberg. 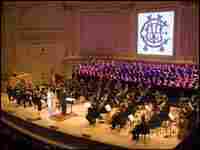 You can hear the entire Carnegie Hall performance on our Web site. Just go to npr.org/music. A presentation of NPR Music and member station WNYC. A piece of spiritual music, written in part right after the passing of his wife Linda, Ecce Cor Meum is the first piece of choral music McCartney has written to include a children's chorus. Hosted by NPR's Fred Child and WNYC's John Schaefer, the special included an interview with McCartney during intermission. Audio for this performance has been removed in accordance with artist agreement; listen to the intermission interview with Paul McCartney.